It’s no coincidence that the South has emerged as ground zero for the latest wave of anti-LGBTQ laws, such as HB2 and SB2 in North Carolina and HB1523 in Mississippi. Rather, it’s a sobering and predictable result of the fact that the Southern LGBTQ community remains politically powerless while those who most ardently oppose our rights have disproportionate political power. This is a structural problem and changing it will require both short and long-term strategies. Political power has a self-evident meaning. It’s also a specific term used in political science, the courts and community organizing to describe how minority communities interact with political processes and if and how their needs, interests and values are represented. Limited legislative power and a lack of elected representation — the focus of this piece — and are two classic symptoms of political powerlessness. LGBTQ Southerners face both. 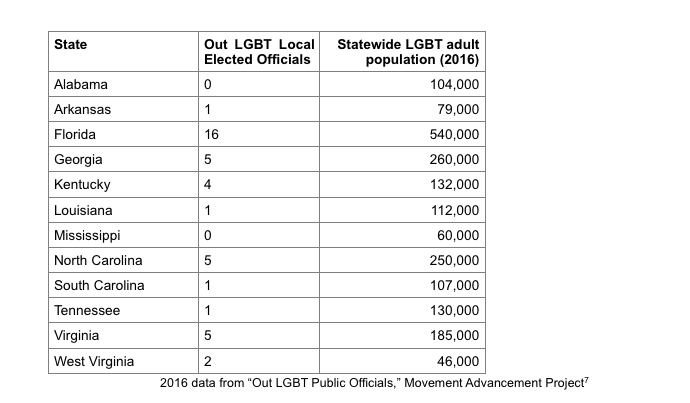 Of note, Mississippi currently has zero out LGBTQ officials. Alabama, Arkansas, Louisiana and South Carolina each have one. Here, we took a closer look at data and dynamics in North Carolina, where we are based and a political battleground state. There are an estimated 336,000 LGBTQ North Carolinians — 3.3 percent of the state’s total population of more than 10 million. North Carolina is the nation’s 9th most populous state, and ranks behind Florida and Georgia for total population among Southern states. There are zero out LGBTQ people representing North Carolina on the federal level. This lack of representation feeds directly into the problem of limited legislative power. Despite growing public support for LGBTQ equality in the South, we still cannot reliably stop discriminatory anti-LGBTQ laws or pass protective measures. Under state law, in every Southern state, it remains legal to fire a person for simply being lesbian, gay or bisexual (EEOC guidance and other court rulings may protect transgender workers may under federal law). The implications of our political powerlessness are playing out in real time in North Carolina. LGBTQ advocates and allies continue to demand a repeal of HB2, a growing majority of North Carolinians oppose the law, and yet legislative leaders refuse to convene a legislative session to discuss repeal. In Virginia, 75 percent of residents support employment non-discrimination protections for LGBT people. Bills to enact such protections have been defeated in at the House subcommittee level in each legislative session since 2010, due to the influence of a small group of legislators who ardently oppose the bill. This entrenched lack of political power in the South is at odds with ever-growing public support for equality both in the region and nationally. National polling shows that 55 percent of Americans support marriage equality and 69 percent support federal employment nondiscrimination laws. A 2016 Gallup poll finds that 74 percent of Americans would be ready to support a gay or lesbian; the question was first asked in 1978 with only 26 percent support. Out LGBT people are getting elected in the South, but in very small numbers. More can, and must. This is a basic democratic premise: a government should represent the interests of its constituency, which is defined as substantive representation. Ideally, it should also represent their identities, which is called descriptive representation. When a marginalized population is descriptively represented in government, it is more likely that they will be substantively represented as well. Research also shows that LGBTQ representatives also impact the opinions and votes of their non-LGBT colleagues. But under-representation also has urgent human consequences in the South, contributing to a climate in which government is, at worst, hostile to the LGBTQ community and in which LGBTQ people do not have a substantive political voice. The effects of this ripple far beyond policy, impacting how individuals understand their relationship to public life and their own political agency. Electing out LGBTQ candidates in the South will require changes to existing structures and systems, the creation of new structures and systems, and — above all — an immediate commitment of funding. The local level is also where substantive change should start. The first and most basic challenge is that Southern LGBTQ people are not being recruited in any significant numbers to run for office at the local or state levels. LGBTQ people are often overlooked by party officials and current elected officials when it comes time to recruit new candidates. Of course, an individual may decide to run without being recruited; but without early institutional support, they are less likely to receive help, endorsements, or funding from existing local stakeholders and influencers. Beyond the issue of recruiting, there are very limited resources to train and support the small number of LGBTQ candidates who do decide to run. If LGBTQ-focused political organizations exist at all in a Southern state (in many they do not), they often focus scarce financial resources on competitive federal and state races. Currently, it’s unlikely that an openly-LGBT person running for local office in the South will receive much or any financial support from a state or federal LGBT political group. Local and state offices are a natural entry point for first time candidates, and when diverse candidates are not elected there, or even recruited to run, they never enter the traditional pipeline for higher office. There is a need to create a new pipeline. To address these structural issues, we propose creating a new political organization, or expanding an existing PAC or 527, in the South. The goals of this organization would be to: 1) increase the number of out LGBTQ electeds in the South, at the local, state and federal levels, and 2) to elect candidates who support LGBTQ legal and lived equality as part of a broader progressive platform addressing equity, opportunity and justice for all. The main function of this political organization would be to financially contribute to candidates and conduct independent expenditures to support their campaign. However, this political organization could also expand its scope to support — primarily through funding and training — localized Southern organizing efforts that address political power more broadly, such as voter registration drives, leadership development and candidate training, building public support for LGBTQ equality, and increasing political literacy and agency in the LGBTQ community. Expanding the recruiting, training, funding and support pipeline to reach LGBTQ people in local Southern communities would represent an innovation in current approaches. Critical lessons and models can be drawn from the successes of national groups like Emily’s List and Emerge, which work to elect pro-choice and/or female candidates, Victory Fund and LPAC, which work to elect openly-LGBTQ candidates. Southern state-based groups like North Carolina’s Lillian’s List and Lead NC are also showing strong results. These lessons and models can be adapted to recruit, train and support Southern LGBTQ candidates at the local and state levels. We believe that that building LGBTQ political power in the South is necessary to achieving full legal equality under state and federal law and to protecting our community from future backlash. It is also directly connected to the larger goal of creating a South in which those who have been historically marginalized — people of color, women, poor folks, LGBTQ people — are represented in our political process. It is, in other words, part of a larger project of democratizing the South.